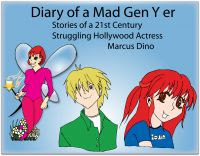 In his novel, ‘Diary of a Mad Gen Y Er,’ author Marcus Dino tells the story of an aspiring actress from Des Moines, Iowa living in Los Angeles, California. Fifi Larouche chronicles her musings, adventures, and humorous observations through unique stories, poems, and blogs, as she works as a waitress while pursuing her dream of becoming a famous Hollywood actress. Fifi has an extraordinary group of friends such as Biff, her on again off again boyfriend, Alocki and her partner Helos, aliens from another planet called Zatoris, as well as Flifi, Fifi’s fairy alter ego. Fifi has a unique gift of rubbing her shoes together before she sleeps which helps her time travel dream. Her dreams take her back to unique times in history as well as into the future where she meets a number of colorful characters. Alocki is always with her in her dreams where they encounter a variety of people and experiences. Characters in the story are unique, eccentric, and full of life, with each seeming to balance Fifi’s personality, while helping her to understand and make sense of the world around her. Through these characters, Fifi has many entertaining adventures allowing her to provide comical observations on many of society’s ‘hot button’ issues. Fifi is a free spirit who confronts life in a unique and extraordinary way. Through Fifi’s thoughts and writings, the idiosyncrasies and hypocrisies of the world are revealed in a comical and sometimes serious way. Her reactions are unconventional and provide not only an entertaining assessment of life, but also some serious and thoughtful reflections. As a Gen Y Er, Fifi shares not only comical observations, but also more serious observations such as her father’s opinion that she is wasting her life trying to become an actress, as well as society’s pressures on Gen Y Ers to conform. Through her experiences and relationships with a wide variety of characters, Fifi shares her outlook on such issues as religion, the future of the planet and its resources, and the function of the brain and how it processes information resulting in how we respond by either through emotion or logical reasoning. One fascinating and unique way of looking at the human body is when Fifi travels into the human body where a discussion with Alocki takes places regarding the affects of unhealthy foods and other contaminants on the body. ‘Diary of a Mad Gen Y Er’ is an entertaining and fun read that will engage the reader from start to end. It is highly recommend to readers of all ages who enjoy quirky characters who share a unique and comical perspective on life. 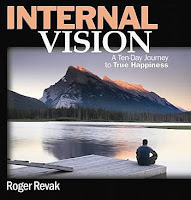 In his book, Internal Vision: A Ten-Day Journey to True Happiness, author Roger Revak, shares a deeply personal story of a devastating time in his life about a ten-day journey that could have cost him his life. Within the story, the author presents a self-help guide inspired by his emotional and physical struggle following his brain tumor diagnosis. In his first forty years, Roger Revak was a man who struggled through life with no clear purpose. Haunted by the verbal and emotional abuse by his father, Revak’s adulthood involved struggling with his own internal conflicts, which affected his outlook on life and his loved ones. He had dug himself into an emotional hole and lived in a cycle of negativity. It was not until his diagnosis of a brain tumor that he began the journey of emotional and physical healing. It is a personal journey of spiritual growth and enlightenment. The book is divided into 15 chapters with each chapter telling the story of his plight with a brain tumor as well as a series of ‘lessons unlearned’ and self-help exercises at the end of each chapter. These lessons include: #1.) What does living in the present mean? #2.) What is fear? (Rational and Irrational Fear) #3.) How do you live in the present? #4.) What’s in it for me (Advantages of living in the present) #5.) What is the downside to living in the present? #6.) Love your inner child as if he or she were your own. #7.) Forgiving yourself. #8.) Creating Happiness (Directions to a peaceful life) #9.) Peace #10.) Happiness 101 #11.) Don’t forget to laugh #12.) How can you learn to be present without having a traumatic experience? 13.) It’s your secret. #14.) Finding your purpose. #15.) Be true to yourself. As Revak points out, “the ‘lessons unlearned’ do not require going through a traumatic experience.” They are principles that can be used by anyone in effort to look at things in a more open way by implementing techniques to acquire self-love, self-respect, and to achieve happiness and maintain it. The author shows us that we can make it through any difficult situation that life throws our way. ‘Internal Vision: A Ten-Day Journey to True Happiness’ is an easy to read and profoundly personal story with a message of love, strength, and hope, that will help guide readers to achieve spiritual happiness and contentment. Within the guide, Grippo manages to filter out any unnecessary information and focus on the “nuts and bolts” of becoming a successful public speaker. It is a comprehensive and easy to follow and understand booklet that touches on all aspects of public speaking. Common mistakes and concerns are highlighted with effective advice on overcoming any hindrances to a successful public speaking event. He provides an account of what makes a good public speaker and how one can achieve that status. Part of overcoming the fear of public speaking is implementing Grippo’s guide and following through. I think the section on Overcoming Fear may be better suited at the beginning of the book, near the introduction, to demonstrate that the following sections will not only teach the mechanics and craft of public speaking, but also overcoming one’s fears by boosting self-confidence. 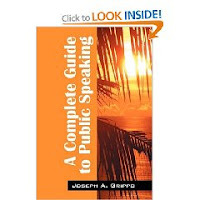 ‘A Complete Guide To Public Speaking’ is highly recommended to those embarking on a career as a Public Speaker and those who want to maintain and improve their current public speaking skills. It would be particularly useful for those wishing to make business and technical presentations. For years, many Americans have become disillusioned with the state of the two-part political system that has dominated politics and government for the past 147 years. With this dissatisfaction, there has been a remarkable increase in Americans registering as Independents. In his book, ‘The Gathering of the Clan,’ author Thomas Richard Harry, delves into the important role Independents could play in the future regarding the need for sensible and logical political change. Harry provides a wealth of information on how the two-party system operates, and how extreme partisanship and extreme ideologies have failed to make government work for most of the people, all of the time. He shows a clear disconnect with the needs of the people and political self-interest. This has resulted in social, political, and economic disarray where a small number of people benefit. He explains the role of Independents and provides a detailed analysis of an Independent philosophy that can help resolve such issues as special interest influences on government, taxes, Social Security, fair wages, poverty, and the working poor. This innovative, well-researched, and carefully crafted book that reveals a comprehensive and rational outlook on how to change the way government governs. The most refreshing aspect of the book is that it is an honest and logical look at the political system and offers ideas without resorting to extreme right or left social and political ideologies. Readers will gain an in depth insight into the current two-party political system and how an Independent voice does count. The details and assessments presented will turn the dissatisfied voter into a hopeful one. Many of the ideas put forth are well worth discussion and debate. I would have liked to have seen a chapter devoted to the news media’s role in maintaining the status quo and how they prop up the polarizing ideologies of the two parties. ‘The Gathering of the Clan’ is a fascinating and compelling account of the state of politics in America and how one can adopt an Independent philosophy that could affect much needed change by challenging the current duopoly with an Independent political party. It is highly recommended to political enthusiasts and to those who have lost faith in the political system.